The word "Breakthrough" is not often used in the Technology niche but i suspect someone might have been preaching this to Tecno Mobile ever since Infinix came head to head with the then rulers of Africa's cheapest and smartest Smart phone mostly used. Now i can see clearly without the use of any eye Google that Tecno might have been doing some underground study to get back the bossy seat from Infinix after they lost the victory since Infinix stormed the market with the Infinix Zero about a year and some months ago. The biggest question is; What is Tecno's plan to take back their place? Ok! i think i know their plans. Tecno Boom J8 right? and the mobile phone is the next big plan of Tecno to reclaim their lost place from Infinix but there is a bigger flop. I think Tecno Boom J8 design has a deeper and close similarity with the Infinix Hot note.You won't blame me for not keeping my mouth shut since alot of persons have been solidly rooted on the beauty of the Tecno Boom J8. Few weeks ago, it was like an Ak-47 Bullet released on me, and i was like; "Why i'm i seeing so much similarities in the mobile market," and i drew up my conclusion that sh*ts happens since there had been a battle between the worlds' greatest brand Samsung and Iphone over claims of imitation and product plagiarism in the past. Now the biggest question we can ask is if the Tecno Boom J8 will penetrate deeper than the Note product of Infinix irrespective of its similarities. Now here is the back view of Infinix Hot Note X551 and that of the recently introduced Tecno Boom J8. Carefully examine the positions of their camera and their back design, this goes a long way to tell you that there is a close range marking either from Tecno on Infinix or from Infinix on Tecno but the question is, Who started it first? In my next article, i will try to make up a post on the features, specification and the price of the Tecno Boom J8. 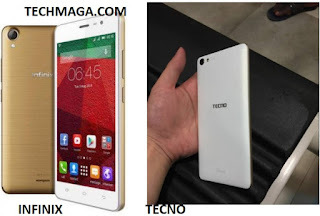 Beside the similarities in look, i think the Tecno Boom J8 is gonna Boom in the Nigeria and African market too. Lets see how it goes. I love to hear what you think of this post, shout it loud using the comment box below this post now.